Stardew Valley (game, 2016). A farming simulation role-playing video game by ConcernedApe. Developed by Eric Barone, ConcernedApe, Sickhead Games, LLC, Eric Barone. Official Trailer. 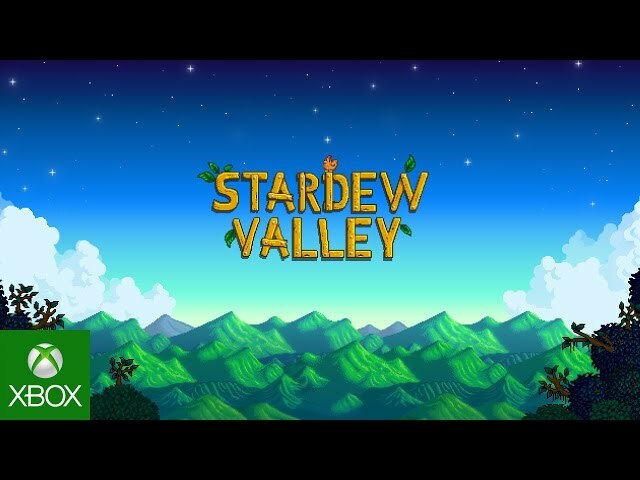 Stardew Valley is a farming simulation role-playing video game by ConcernedApe, developed by Sickhead Games, LLC, Eric Barone and Eric Barone, ConcernedApe. 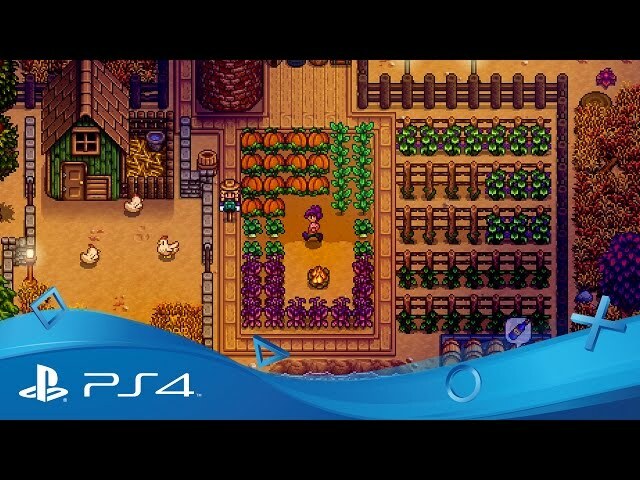 Stardew Valley - Gameplay Trailer | PS4. Stardew Valley is a farming simulation game primarily inspired by the Harvest Moon video game series. At the start of the game, the player creates their character, who becomes the recipient of a plot of land including a small house once owned by his or her grandfather in a small town called Pelican Town. The player may select one of five farm maps according to their preference in play style, such as one with extra foraging spots, one with more mining resources, and another with a river used for fishing. The farm plot is initially overrun with boulders, trees, stumps, and weeds, and the player must work to clear them in order to restart the farm, tending to crops and livestock so as to generate revenue and further expand the farm's buildings and facilities. The player may also interact with non-player characters (NPC) that inhabit the town, including engaging in relationships with these characters; this can culminate in marriage, which results in the NPC helping the player's character to tend the farm. The player can also engage in fishing, cooking, and crafting, and also explore procedurally-generated caves with materials and ores to mine or battle creatures within. The player can take on various quests to earn additional money, or work at completing bundles; specific collections of materials offered to the town's Community Center. Completing bundles rewards the player with various items, including seeds and tools. Completing multiple bundles grants the player access to new areas and game mechanics, such as a desert and greenhouse farming. All of these activities must be metered against the character's current health, exhaustion level, and the game's internal clock. If the character becomes too exhausted, they will be returned to their house and restored with energy on the morning of the next day, but having forgone any opportunities to continue in activities from the previous day. If the player loses too much health, they will lose most of their energy and a random amount of money and items. The game uses a simplified calendar, each year having only four 28-day months that represent each season, which determines which crops can be grown and which activities can be beneficial. The character is evaluated on their third year. There is otherwise no deadline for completing the game, and as of 1.1 the player can be re-evaluated. 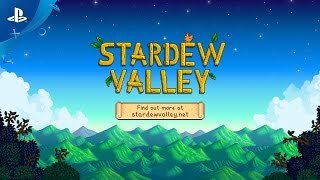 Stardew Valley is a farming simulation game primarily inspired by the Harvest Moon video game series. At the start of the game, the player creates their character, who becomes the recipient of a plot of land including a small house once owned by his or her grandfather in a small town called Pelican Town. The player may select one of five farm maps (introduced in version 1.1) according to their preference in play style, such as one with extra foraging opportunities, one with more mining resources, and another with a fishing river. The farm plot is initially overrun with boulders, trees, stumps, and weeds, and the player must work to clear them in order to restart the farm, tending to crops and livestock so as to generate revenue and further expand the farm's buildings and facilities. 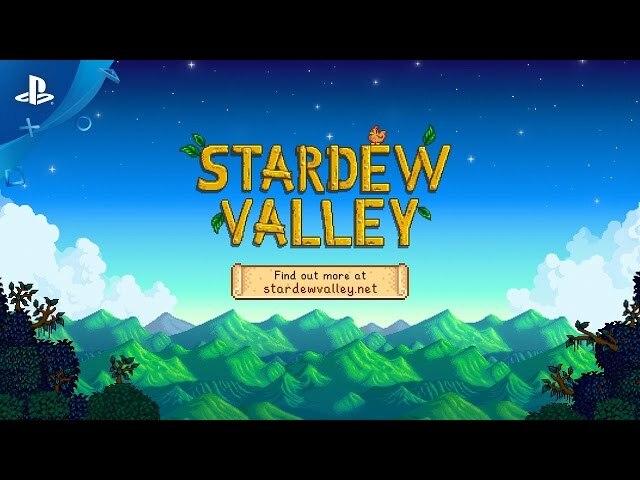 Stardew Valley was scheduled to be released by ConcernedApe on February 26, 2016 (worldwide), on July 29, 2016 (worldwide), on December 13, 2016 (North America), on December 14, 2016 (worldwide), on April 11, 2017 (North America), on April 13, 2017 (Europe), on October 5, 2017 (worldwide), on May 22, 2018 (worldwide), on May 24, 2018 (Europe) and on October 24, 2018 (worldwide). This video game is available for the following platforms: Microsoft Windows, OS X, Linux, PlayStation 4, Xbox One, Nintendo Switch, PlayStation Vita, iOS and Android.